Indoor Plants the Reasons You Should Have Them. All you have to do is look at the purple petals of a vibrant African violet and you’ll stimulate the release of adrenaline. As a result, your energy levels will rise and oxygen flow to your brain will increase, helping you relax. Instead of spending a small fortune for a pricy appliance to regulate dry winter air, place a few Ferns around your home. They release moisture through a process called transpiration, which is when the pores on the bottom of the leaves basically sweat and release much needed moisture. According to belief, Aloe Vera was known as the “plant of immortality” in early Egypt and used to heal wounds. Today, people typically rub it on sunburns (Cyprus sun) or burns to relieve pain. The next time you experience writer’s block, hit up your local green house. According to experts Colorful leaves inspire and energize their surroundings — including your home. If you get the sniffles every winter or summer due to dust, you need a few Spider Plants in your life. You see, the leaves absorb allergens (such as dust) and in a week flat this plant should eliminate almost 90% of toxins in a room. If you want to know the air you’re breathing at home is healthy and clean, look no further than English Ivy. NASA scientists found that it’s the number one air-filtering houseplant, because it’s the best at absorbing formaldehyde. Since red is a stimulating color, known for increasing appetites and providing a boost of energy, the trim on Red indoor plants will provide perks in your home. Keep it in your bathroom to wake you up as you get ready in the morning. Studies have shown and found that students demonstrated 70% greater attentiveness when in a room with plants. There are a slew of varieties that can survive in offices with little light, but bamboo will give your work space a much-needed feng shui boost. It is known that, flowering houseplants help decrease stress levels. Now that’s something just about every room in your home could use, right? 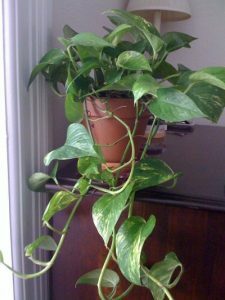 Many people believe all you have to do is look at a Pothos plant when your eyes are irritated or tired (perhaps after hours in front of a computer) to relieve eye strain. It’s also believed to prevent glaucoma or cataracts. Besides all of the above, they add color and are fantastic space fillers, and add a element of luxury to a home. Bringing your garden inside. Happy potting.